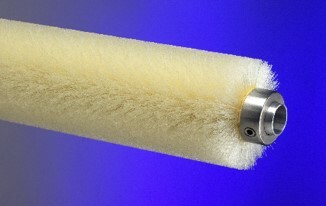 Industrial Brush Company’s Circuit Board Processing brushes are specifically designed to provide maximum deburring, cleaning, scrubbing and oxide removal for circuit board manufacturers. 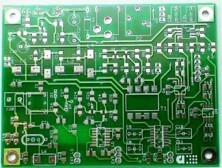 They are used in a wide range of processes such as copper plating and tin-lead solder coating, de-burring, surface preparation, and electroplating. Our “Fineset” brushes provide uniform bristle density, excellent balance and maximum bristle retention making this design ideally suited for maintaining uniform surface finishes. Each Brush is trimmed and ground insuring filament sharpness and concentric brush operation. 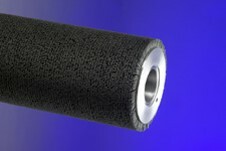 Our Brushes use DuPont™ Tynex® A as our choice of abrasive filament. The Silicon Carbide grit particles are impregnated throughout the filament and not coated like sandpaper. Fresh grit is exposed as the nylon wears. 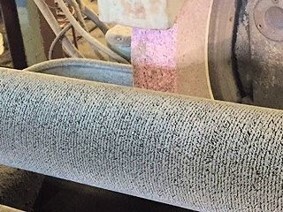 As the grit particle size becomes larger so does the filament diameter making the brush more aggressive. 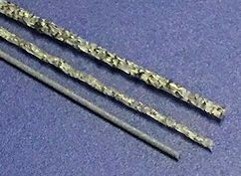 Silicon Carbide bristle brushes offer several advantages when compared to compressed wheel style brushes. 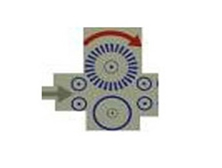 Silicon Carbide bristle brushes prevent loading and are self-cleaning. They wear more evenly when running varied board widths therefore require less adjustment and dressing maintenance. 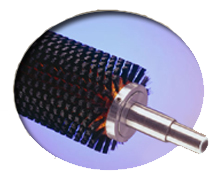 Industrial Brush Company manufactures a complete line of Circuit Board processing brushes for most popular machine types. Standard sizes available in 140mm OD and 100mm OD in 500-320-240 and 180 grits. Custom sizes and grits are available upon request.